Today marked the first of two press days at the Los Angeles Auto Show before it opens to the public this weekend. And as much as it was defined by what was there, including the Nissan 370Z and the unveiling of the Mini E, what wasn’t there was equally striking. While Ford and Chrysler were in what seemed like business as usual mode (albeit more subdued), GM’s public relations presence was more…an absence. There was no press conference. And in their section, there was much more carpet than cars. I guess they could cross market with carpet manufacturers the way Tide advertises with clothing from Ann Taylor loft. Maybe it left more space for the elephant in the room. Even the Hummer was hidden off to the side – possibly a timeout? On GM he said, “Frankly, I applaud them for not being here. They are in survival mode.” And on the idea that no bailout meant less competition, Castignetti was crystal clear, “I don’t think losing car companies at any level helps anyone. You need competition. I wish them well. So many people in the US’ jobs depend on the auto industry. The numbers of job losses could be catastrophic.” He went on to say that 2009 could be difficult for the auto business, but that he’s looking forward to 2010-2011. 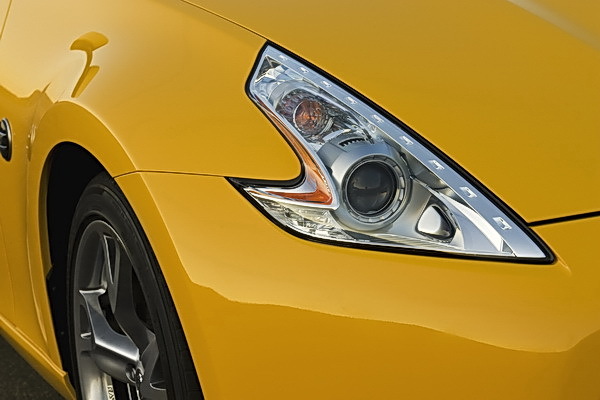 And the 370Z’s headlights will light the way. Speaking of the 370Z’s, this was my favorite car of the show. While I wasn’t a fan of the 8 directional navigation system with its 12 button control panel and their tiny print, (you might as well text while you drive), the generation gap between the 370Z and 350Z is akin to a baby boomer trying to relate to their grandchildren. To truly get a feel for the transition from the 2008 350Z to the 2009 370Z, visualize yourself: you have fluffy hair, bell bottoms and listen to England Dan and John Ford Coley. Too obscure? Try this: the Partridge Family is on TV – the first time around. Some of the 370Z’s most distinguishing features holla back to the tough looking 1972 240ZX. It has the same angular, geometric shape-highly visible around the B-pillar. 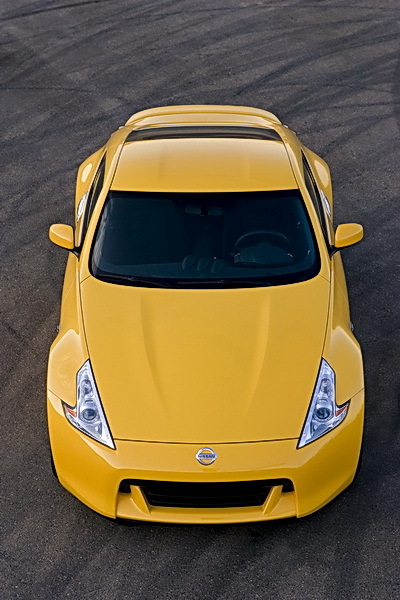 Unlike little brother 350Z’s sleeker, smoother lines, the 370Z looks stockier, beefier, but not like a male gymnast. Like a male guy-who-could-kick-your-a%!. Now, before this car turns around and runs for Governor of California, it must pay homage to ITS tougher brother, the GT-R. If the 370Z is competing with Mustang, the GT-R is playing chicken with Corvette. In relation to the 370Z, there are fewer GT-R’s, they’re more expensive and this series just became available in the US. Oh and of course, the GT-R is Motor Trend’s car of the year. But they do share some basic muscle-like design features. These two Nissans have a hierarchy like the Baldwin brothers. Though with the Baldwins, it’s hard to know who’s who. Not the case with the Nissans. Though they may fight about who’s boss. Will Santa Bring Me a Bugatti?